Bin Laden is dead. Terror and terrorism continues. So does martyrdom. But what a difference between the two types of deaths. A terrorist takes his life and others. The martyr gives his life for others. One is an act of violence in which evil destroys goodness and humanity. The other is an act of love and self surrender that destroys evil with goodness. Many realize that we are living in the age of terrorism never before seen in the world, however, they fail to see that we also are living in an unprecedented time of martyrdom in human history. 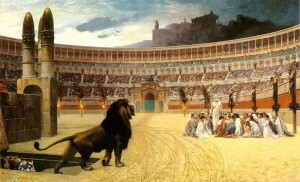 Most consider that the great gift of martyrdom for the faith occurred in the first centuries of the church. Rightfully so, the blood of the martyrs was the seed of the beginning of the church and 11 Apostles gave their life for Christ and his church. For the first three centuries, most popes died a martyred death until Rome was converted by their blood and the blood of others. But who are the martyrs in our own time — those slain for their witness to the faith? They are found in the death of eight Trappist monks in Algeria — an account poignantly retold in the movie, “Of Gods and Men.” Martyrs are also to be found in the three sisters of Mother Teresa’s order who were killed in Yemen in the 1990s. South and Central America also have well-known martyrs — both religious and lay. Archbishop Romero is one of the most recognized — slain during the celebration of the Mass March 24, 1980. The 20th century is known for being the most violent in human history. It produced wars and martyrs because of several bloody forms of Communism and fascism. One estimate says at least 100 million people died from Communism in the 20th century with 50 million in China, 25 million in Russia and another 20 million dying at the hands of Nazis. Of course these were not all martyrs for faith but many were. Many others died in Sudan and other African countries, the Middle East, Mexico, Vietnam, India, China, North Korea and Indonesia. There is no list that could include all the martyrs of our own age. But as the Second Vatican Council document “Lumen Gentium” declared: “Since Jesus, the Son of God has manifested his love through the surrender of his life, no one has greater love than the man who surrenders his life for Jesus and his brothers.” ( I John 3:16, John 15:13). Jesus warns us in a rather prophetic word about religious terrorism that “the hour is coming when everyone who kills you will think he is offering worship to God” (John 16;2). What is ahead for the church? A time of persecution and martyrdom? It is already here but we just don’t realize it. Are you ready to give up your life for Christ and his church? Maybe it wont be a red martyrdom but a white one that demands a willingness to stand in truth and live the Gospel in an age that destroys lives through secularism and relativism. This is nothing more than taking our baptism seriously and salvation of the world as our mandate. It happens one surrendered life at a time. Fr. Michael Shields is pastor of the Church of the Nativity in Magadan, Russia. This article courtesy of Catholic Anchor, Newspaper of the Archdiocese of Anchorage, Alaska.